Reclaiming lost space in the suburbs. 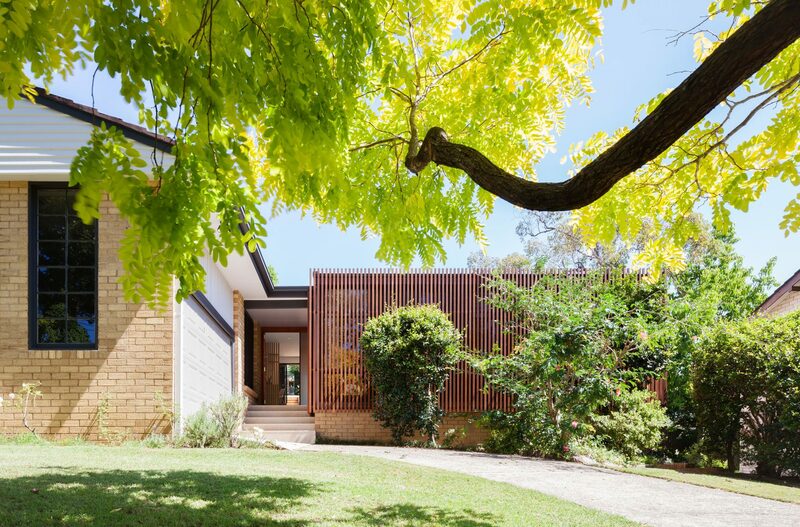 A 1960s brick home in Sydney’s northeast turns formality on its ear, taking the indoors out. To create more space, its underutilised front verandah is dissolved into an extended living room, with floor-to-ceiling glass catching northern sun through a striking timber screen element. Escu means ‘shield’ in Old French, however, the timber brise soleil that transforms this suburban home is more than just a privacy screen. It contemporises the façade with a strong graphic element serving a dual purpose. The existing front verandah was replaced with an extended front living space, filtering the view of street and neighbours with floor-to-ceiling hardwood battens. This contemporary filigree moderates the northern sun, allowing the full height glazed sliding doors to be opened without any hesitation. Where once the living room turned its back on the street aspect, the new brise soleil becomes the backdrop for a nuanced connection to the front garden. The reconfigured kitchen and family room are opened up and streamlined with a bespoke wall of joinery and in-built furniture. The neutral palette of white and timber is freshened with colour bursts that include splashback tiling, architectural fittings and a lush deep blue feature wall. A considered approach to the allocation of space focused on the reality of the family dynamic, in addition to a balanced application of joinery and materials, has created a highly functional home that offers an oasis for a family of four within a small, intelligent package.